In January 2011, the United Nations Secretary-General, Ban Ki-Moon, declared that 2012 will be the International Year for Sustainable Energy for All. He called for “a global clean energy revolution – a revolution that makes energy available and affordable for all”, adding that this was essential for minimizing climate risks, reducing poverty and improving global health, empowering women and meeting the Millennium Development Goals, for global economic growth, peace and security, and the health of the planet. 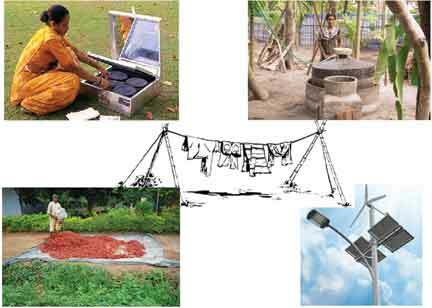 On the eve of the International Year for Sustainable Energy for All, more than 130 crore people worldwide (one-fifth of humanity) have no access to electricity, and 270 crore people (two-fifth of humanity) rely on traditional biomass for cooking. Nearly twenty lakh women and children, die prematurely every year (that is four every minute) due to illnesses that are a result of indoor air pollution caused by cooking. The energy sector is the single biggest contributor to climate change accounting for 60 per cent of global greenhouse gas emissions. The stated goal of the international community is to meet three objectives by 2030, namely ensuring universal access to modern energy services, doubling the rate of improvement in energy efficiency, and doubling the share of renewable energy in the global energy mix. It is in this context that we are thinking aloud on renewable energy. We begin with trying to understand energy, put renewable energy in context and move on to understanding its different aspects. The end use efficiency, which strictly does not belong to the field of renewable energy, is also covered, since a unit of energy saved is equal to one and half to three times energy produced. We end with some ideas for action for you, your family, class, and the school. The authors are from Prayas Energy Group, a Pune-based voluntary organization working on energy policy. Sreekumar N is an Electrical engineer with 25 years of experience in energy policy and interest in school science education. Ashwin Gambhir is a Senior Research Associate. He works on policy and regulatory issues with regard to renewable energy along with options for climate change mitigation.